CLICK HERE TO REGISTER NOW FOR FREEHOLD ART CAMP 2018! Only $175 for the full week! Second sibling is only $160! Art Camp provides a hands on learning experience for children in a fun, creative environment. Students will explore the world of art by choosing from one or more of our weekly programs. We offer weekly classes in colored pencil ceramics, acrylics, clay, charcoal, cartooning, watercolor, clay, sewing, fashion design and jewelry making! Register online today! We also have Multi-Media Art Camp at our Morganville Location! View our Summer Camp Schedule Below! - Two One-Day Painting Camps - $39 per day! 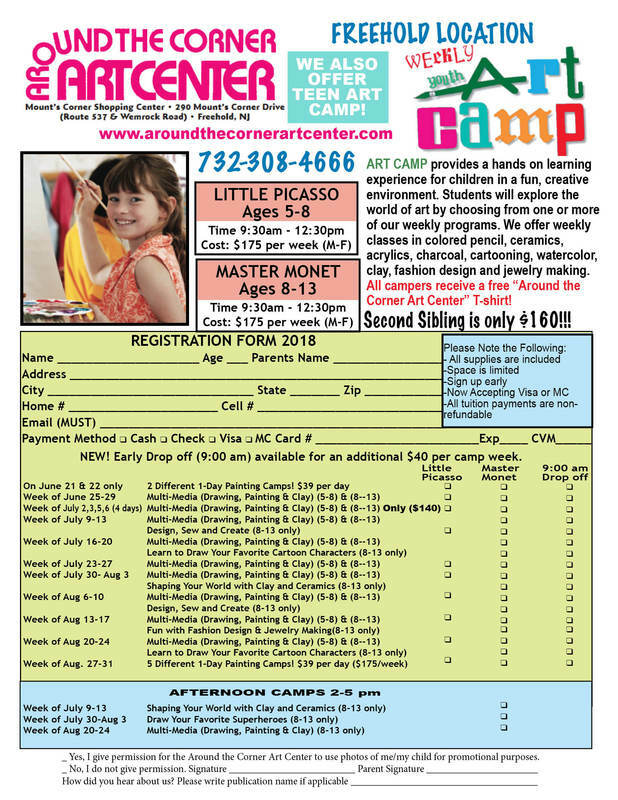 ​CLICK HERE TO REGISTER NOW FOR FREEHOLD ART CAMP 2018! In addition to these FREEHOLD ART CAMPS, we also have Multi-Media Camp all summer long at our MORGANVILLE location, and Teen Camps in FREEHOLD too!